You may have noticed that Looking Glass at 3634 Georgia has been closed for a few weeks. They had a small kitchen fire in late January that was quickly extinguished but caused some damage, and repairs and permits took longer than they expected. But as of yesterday, they're back open and ready. 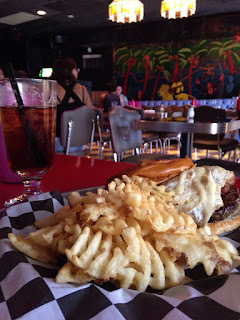 Looking Glass is one of my favorite spots: good bar food, relaxed neighborhoody vibe, friendly bartenders and in general a great spot. If you haven't been, check them out, and if you have, head back there! A friend spotted a nice new sign for the shopping center where The Midlands and Walls of Books are. The Midlands is the new beer garden coming to 3333 Georgia from the Kangaroo Boxing Club folks this spring, while Walls of Books is already open. It's a pretty great looking sign, and I like how it's more branding for the Park View neighborhood, which is getting to be more well known. A few years ago if you mentioned Park View, people would mostly say "where?" And there's a blank space at the bottom, which is hopeful to me. There's a lot of empty spaces in that shopping center. Here's the site from Google Streetview. Midlands will be taking the leftmost space and Walls of Books is in the corner. The Post Office is on the far right. Eat or drink at Slash Run today, help a cancer research charity! Here's a great way to help cancer research, and all you have to do is eat or drink at Slash Run! Local resident Brittany Kademian has organized a fundraiser at the Petworth restaurant for the Dana-Farber Cancer Institute, a research and treatment nonprofit. The deal is simple: go today between 5pm and midnight and they'll donate 15% of all proceeds. Today is also trivia night there starting at 9! If you haven't been, Slash Run at 201 Upshur Street NW is great. It's run by the same folks who have El Chucho and the coming soon Little Coco's, and specializes in awesome burgers and whiskey. They also have really good schnitzel sandwiches and a killer jukebox. 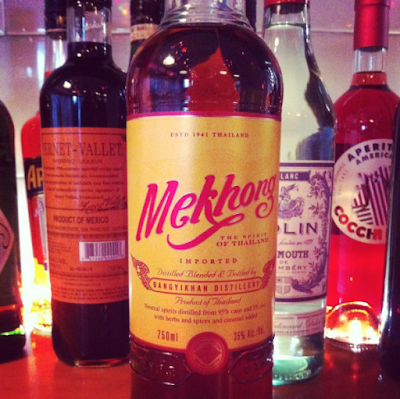 Drink whiskey, eat burgers, help charity? I can get behind that. Slash Run worth a visit, and what better time than today? Here's more from Brittany about the fundraiser. Dana-Farber is a world leader in cancer research and treatment, renowned for using its discoveries to improve the treatment of adults and children with cancer. It is the founding member of the Dana-Farber/Harvard Cancer Center, a National Cancer Institute-designated Comprehensive Cancer Center. It is also a federally designated Center for AIDS Research and a teaching affiliate of Harvard Medical School. Dana-Farber Cancer Institute is the only cancer center in the country ranked in the top 4 for both adult and pediatric cancer programs. I am doing this fundraiser with Slash Run because I am running the Boston Marathon this April to help raise money for this cause through the “Dana-Farber Marathon Challenge” program. My personal goal is to raise $10,000 for Dana-Farber in honor and memory of loved ones with cancer, and also to help with cancer research and cancer care for those that need it most. If you're like me, you have fond memories from graduating high school: prom, the cap and gown, the graduation ceremony, getting your diploma, and maybe even a senior trip where you celebrate the end of high school with your friends and see something new. The Columbia Heights Educational Campus at 14th and Irving, which includes Bell Multicultural High School, is coming up on their graduation, and some students need a little help paying for their expenses. Senior class president Saba Amare more than 80% of seniors at Bell receive free or reduced lunch and receive other public benefits. That makes it hard for them to pay for all of the fees. Felix Breedlove, an educational aide at the school, reached out to tell me about a fundraiser the senior class is holding to help students who need it pay for these expenses. It sounds like a great way to help local students get the full high school experience. Here's the link to the fundraiser. 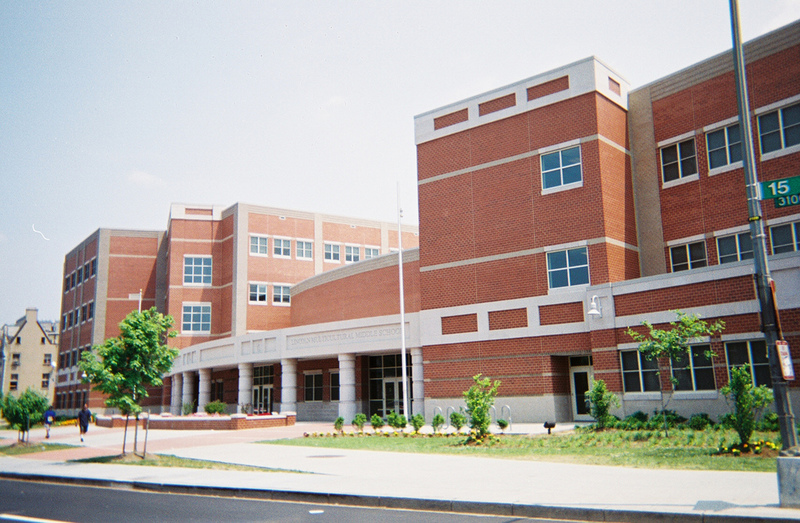 We are the Senior Class Student Government representatives at Bell Multicultural High School, a public school in the Columbia Heights neighborhood of Washington D.C. This year, our graduating class has been working tremendously, in order to raise enough money to decrease the cost of our senior fees of $300/per student. This total only accounts for the each students Cap and Gown, Graduation Announcements, Yearbook, 1-Prom Ticket, Senior Class T-Shirt, and a Senior lunch. This amount is extremely expensive, considering this total does not include the Senior Trip to New Jersey and New York, currently priced at $350/per person. Although our Senior Class fees have decreased over the years through fundraisers, donations, and etc., we refuse to simply sit around and pout! Although, this looks perfect in our heads, unfortunately we are struggling economically, and thus apprehensive about the possibilities of graduating with this debt. More than 80% of students in the senior class receive free/reduced lunch and receive other public benefits. The economic instability of many of the students’ households further hinder the affordability of these fees. As Student Government representatives, our job is to voice the concern of our peers and figure out solutions. That is why we are reaching out to people who are compelled to support us! School Bake sales are just not cutting the costs lower enough and considering we have to pay these fees by May 20th, we do not have much time! Hopefully you can support the 211 students graduating this year, by your generous donations! Any amount is of service, as it accumulates, and inevitably makes a vast difference. On behalf of the Bell Multicultural Class of 2016, I would like to say THANK YOU in advance! The fundraiser is for the entire senior class, which constitutes of 211-students. The fund-raiser shall cover expenses for those students who face financial difficulties and/or challenges. 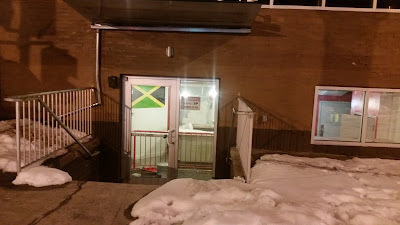 Looks like the new Jamaican restaurant coming to the old Getaway space at 14th and Meridian is almost ready to open. A reader sends in that she spoke with workers there and they're planning to open the first week of March. They're going to use both floors, like the Getaway (and Social before them) and they have a nice bar on the ground floor. The other neat thing is that they'll serve brunch. I'll be interested to check that out. Jamaican food is pretty delicious, but I've never had Jamaican brunch. They also said they're not connected with Sweet Mango, the recently closed Jamaican spot at Georgia and New Hampshire. This space (the ground and first floors) was the Getaway, a 60s-70s car chase themed restaurant and bar which was pretty solid but closed after a few years. Before that, it was Social, which was kind of odd and didn't last long. I wish these folks better luck! I'll definitely be excited to try it. At the corner of Kenyon Street and Georgia Avenue NW sits humble and historic Morgan’s Seafood. And outside Morgan’s Seafood sits Romeo Morgan; greeting each and every passerby. “It’s easier to say HELLO than it is to say HELL-NO,” Romeo touts. 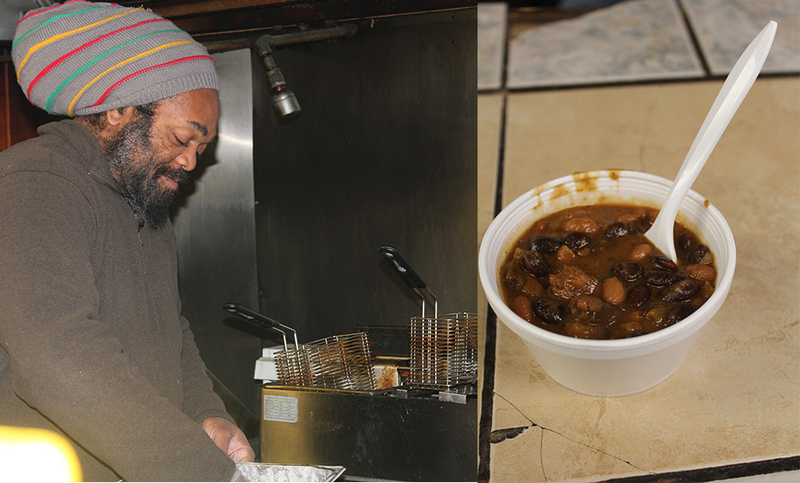 We sat down over a bowl of his aunt’s venison chili to discuss the history of Morgan’s, his plans for the future, and his views on the neighborhood. Romeo says Morgan’s Seafood, in its eighty-third year of business, is the longest standing black owned business in the District. 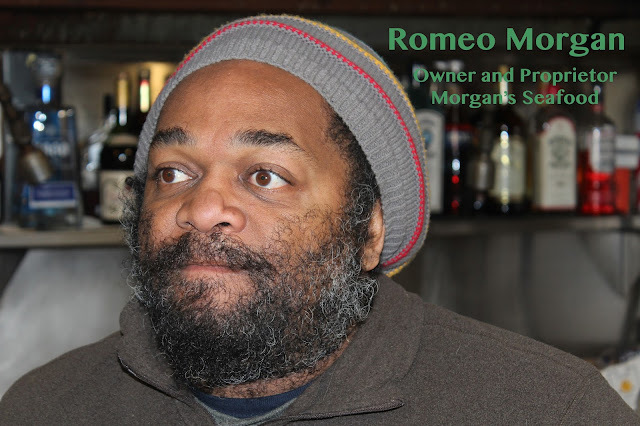 Started by Romeo’s great-uncle Maurice Morgan; Romeo has been around the business since he was a kid, but officially took over twenty years ago. And he says no, despite the neighborhood rumors, Romeo was NOT adopted. Everything available at Morgan’s Seafood is fresh. 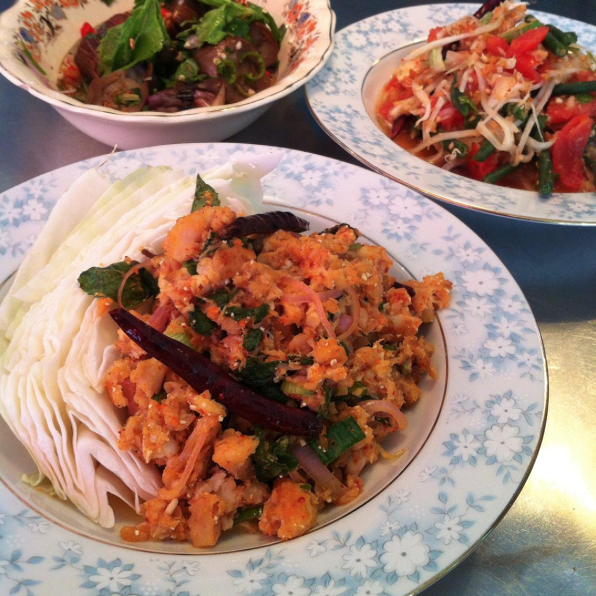 Everything is bought fresh, cooked fresh and served fresh. Even the sauces are made on site. He refuses to use anything out of a can or use any artificial preservatives. In order to cater to vegetarians he has eliminated the use of meat in his vegetable recipes. According to Romeo the number one sellers are the crab cakes and fried shrimp, but his favorite is the fried trout. As President of the Georgia Avenue Business Alliance (GABA), Romeo fights for the historic and culturally significant aspects of Georgia Ave. and the surrounding areas. He uses his experience as a teacher, a shop owner, a construction worker, a mechanic, a photographer and a volunteer to help mold the potential of businesses in the area. Working alongside the Georgia Avenue Community Development Task Force, the Alliance has been able to help over one hundred small businesses in the area get grants for renovation. He also helped with the Georgia Avenue WinterFest last year, attended by over three hundred people. However, the city doesn’t seem to be on his side; he said there have been several developments in the last few years aimed at making it hard for current owners in the area to profit from their businesses. For example, he said a street sign talking about the history of the area and specifically the restaurant (depicting Maurice Morgan) was taken down without consulting or even notifying Romeo. “The history is going to be here whether the sign is up or not,” Romeo declared. That is certainly true glancing at the walls decked with pictures and old documents. The best thing you can do as a member of the Columbia Heights community, according to Romeo, is to not get engrossed in what is shiny and new; instead invest in your neighbors and be successful together. Give your business to those who have earned it, not by being new and hip, but by lasting decades building upon family recipes and the history of the city. Hold the city accountable for whom it gives its grants and permits to. His message to the youth of the neighborhood is to not let the attitudes of some affect your own attitude about the community. While there is no excuse for ignorance, it’s even worse to let that turn into hatred. Not only has he witnessed a change in demographics, with that has come a change in spending habits. Many of the younger people moving into the neighborhood don’t go out during the week. They would rather save their money and spend it at the bars on the weekends. He says the community used to eat out a lot, supporting the small businesses in the area. This means a change in hours of operation for those businesses that can handle it. Changing from weeknight dinners to late night munchies. Despite his roots in the city, he calls himself a “country boy” because of his love for fishing and hunting. He also has a second residence in Marlboro, MD, where he raises chickens and ducks. On the property is a kennel that he uses to house rescued dogs; rehabilitating up to sixteen dogs at a time taken out of shelters and eventually given to good families. He can’t escape to the country but once or twice a week, but the lifestyle has inspired him to open up a new Morgan’s on the water in Galesville, MD, at 1004 Main Street. It will be half liquor store, half restaurant. And while the liquor store will be opening up in a few months, Romeo has big renovation plans for the restaurant side that will keep it closed until about September. Romeo plans to have a shuttle bus service to take DC residents to the new location overlooking the yacht harbour. He wants to give community members the chance to escape the city every now and then. But for now, your freshest seafood is right around the corner on Georgia Avenue; and it comes with free conversation and a smile. “Morgan’s is here; we are not going anywhere; we sell fresh seafood, fresh food. Come in and try some! Have a cold beer while you’re at it!” he chuckled. Morgan's is open 11am-12am Monday through Thursday, Fridays and Saturdays until 2am. 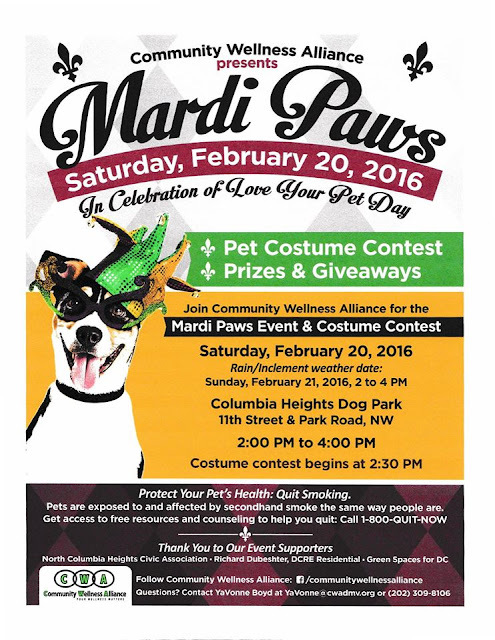 This sounds like fun: the Community Wellness Alliance, a health nonprofit, has organized a pet festival on Saturday, Feb. 20 from 2-4 pm. There will be a pet costume contest, which sounds hilarious, plus other giveaways. Check it out! WMATA meeting Thursday: got issues? Suggest a 14th Street express bus? Longtime readers of this blog know that I'm a big proponent of adding an express bus on 14th Street: it's not unusual for it to take 45 minutes to get downtown from our area due to stops on every block, congestion and the like. And maybe there are other issues you have too! The meeting is at 10am Thursday, Feb. 18 at the Wilson Building (14th and Pennsylvania NW) at 10am. Here's an email from ANC4C commissioner Zach Teutsch about the 14th Street express bus. He make some great points. If you've ever taken the 14th Street buses very far, I am sure you've noticed that they stop...a lot. Perhaps you've wondered why there isn't an express option, like there is on 16th. If you get on the 54 at Buchanan street and get off at I Street, it takes 26 stops. The S9 covers the same distance with ​9 stops. ​Many people in Petworth, 16th Street Heights, Columbia Heights, and other neighborhoods around here need to travel downtown and it's time we had a faster public transit way to do it. Please let me know if you can attend and advocate for our community! Several months ago, ANC 4C passed a resolution in support of funding express bus service on 14th Street. WMATA has studied and endorsed express service, in their 2012 analysis of the line, but it hasn't been funded. The study recommending this express service (link: http://www.metrobus-studies.com/52-53-54/14th%20Street%20Line%20Study_Final%20Summary%20Report_10192012.pdf) was conducted in 2011 and 2012. The key recommendation for express service, is discussed in detail, beginning on page 33. Additional related materials are available here (http://www.metrobus-studies.com/52-53-54/52-53-54.htm). Though it was already a good idea in 2012, the need for improved bus service along 14th street has become much more urgent since the study was conducted as unprecedented development has occurred along the 14th street corridor. Residents and businesses would benefit tremendously from faster service, more service, and better service. The city as a whole would benefit from this investment, better employment opportunities for people seeking jobs, less traffic congestion on important north-south streets, and a broadening tax base which can support better services for all District residents. Adding this service would be relatively inexpensive (about $1.3M). It may even generate more revenue in increased commerce than it costs to fund. These buses are needed for longtime residents and new residents as well. This would be a huge (and cheap) win for DC. Please let me know if you'd like to help make this a reality! 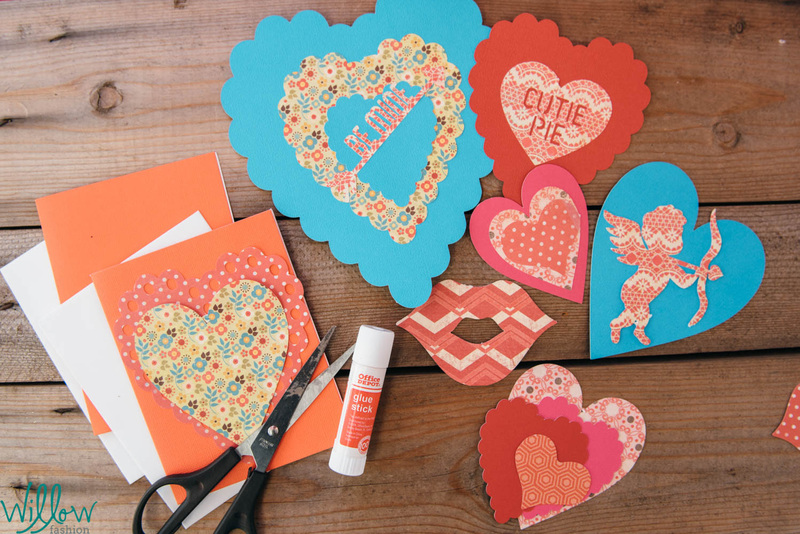 The weekly event is kind of a drop-in clinic for making things, for all ages, and sounds like a lot of fun as well as being useful. Since its inception in 2013, the practice has functioned broadly, spanning broken bicycles to broken hearts. McEntee has helped people in public parks, coffee shops, art shows, and online. The Make/Fix Anything Project will help you make or fix nearly anything... for free! 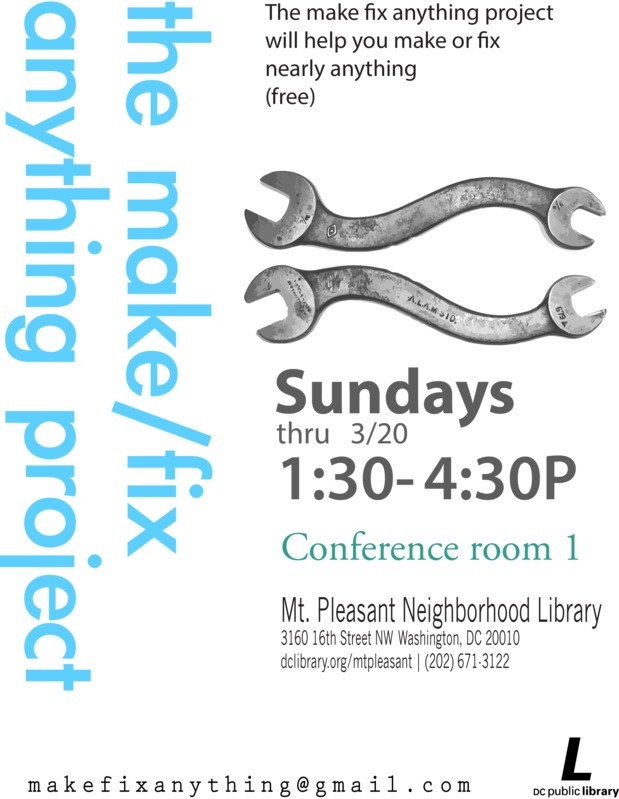 The Make/Fix Anything Project takes place in Conference Room 1 on Sundays through 3/20/2016. Come by Mt. Pleasant Library between 1:30-4:30 p.m. and try your hand at making and fixing. * - McEntee reserves the right to refuse assistance for projects deemed unethical. For instance he may help you make a rocket ship but probably not a machine gun. 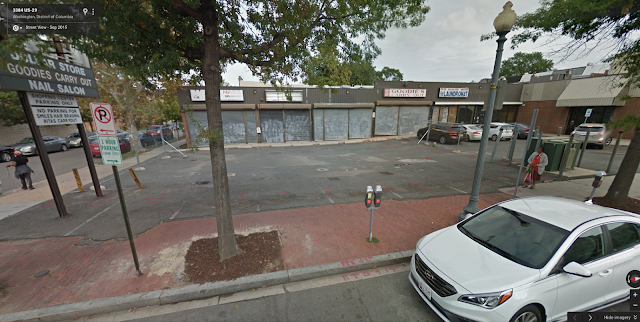 This sounds good to me: &pizza, the fast casual pizza chain is coming to the old 826DC on the Columbia Heights Civic Plaza (14th/Park/Kenyon) has applied for a liquor license, according to the city. Their application includes a sidewalk cafe with 32 seats, plus 46 inside. I think eating pizza and having a beer or wine on the plaza on a nice night sounds pretty good to me. They're aiming for sometime early this year to open, so presumably pretty soon. 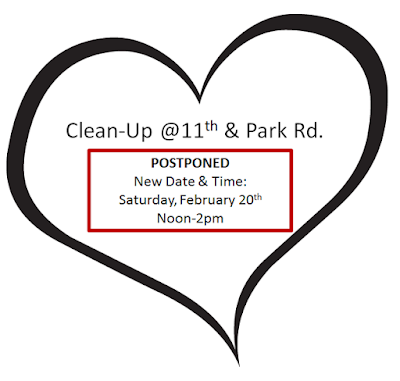 A couple of weeks ago I wrote about a new local nonprofit, 11th and Bark, which was planning a cleanup of the 11th and Park Dog Park. However, due to bad weather, that was cancelled and rescheduled: it's now going to be Feb. 20. So if you have a dog, or just want to help out, check it out! And you can sign up for 11th and Bark here It sounds like a good cause, the park could certainly use some TLC. If you live on or around Georgia Avenue, or are interested in issues there, here's a rundown of upcoming community meetings compiled by the Georgia Avenue Community Development Task Force. Check them out! The Main Streets sounds particularly interesting, the idea is to form a group to help local businesses, much like Adams Morgan Main Street and others. Pleasant Plains Civic Association – Tomorrow! 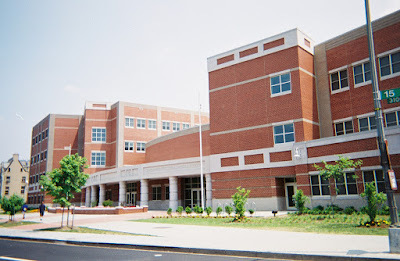 The monthly Pleasant Plains Civic Association meeting will be tomorrow – Saturday February 13th at 12:00 at the Banneker Recreation Center at 2500 Georgia Avenue NW. On the agenda is Danny Silbert from the Best Kids Mentoring Program, Denise Blackson from the Office of the People’ Counsel Energy Efficiency Workshop, and updates on important community developments. The next meeting of the Georgia Avenue Community Development Task Force will be Wednesday February 24th at 7:00pm at 2616 Georgia Avenue NW. It will include a presentation from Michelle Stearns of Good Neighbor Fuels who provides workshops for high-school aged youth in STEM subjects, specifically applied chemistry with a practical application of a Biodiesel laboratory, where fuel is created out of waste veggie oil. Oh, the Metro escalators, a source of unending frustration. The escalators on the east entrances of both the Columbia Heights Metro and Georgia Avenue Metro escalators are slated to be replaced, and the timeline is absurd: for Columbia Heights, they'll be closed for 35 weeks, while at Georgia Avenue-Petworth, they'll be shuttered for a ridiculous 45 weeks. That's longer than it takes a human baby to gestate in the womb. 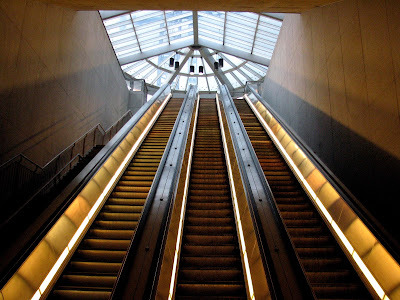 You can get pregnant right now, carry the baby to full term, and celebrate its first month of life before the Georgia Avenue Metro escalators get replaced. Honestly, given 45 weeks, I think scientists can invent a better form of transportation from the street level to the Metro. Maybe a teleporter or some kind of Alpine Slide. A fireman's pole would be fun. Park View DC has more: Metro officials say the timelines are so long because the work can only happen when the stations are closed, which is about 4 hours a day. The current escalators are about 16 years old, though they say the normal lifespan of an escalator is 40 years. It's stuff like this that makes me question why we even have escalators. New York City, which has hundreds of stations, only has stairs and elevators. Just build more stairs and elevators and let's be done with this tremendous waste of time, energy and money. And even when these new escalators are put in, I would be shocked if they actually worked most of the time. I guess we'll find out in just under a year. In the meantime, check out my joke Twitter account: Are the Columbia Heights Metro escalators working? It just tweets various forms of "no." Do you like pinball? If so, get yourself to Lyman's, which is forming a league. I spoke to Lyman's owner Kevin the other day about it and it sounds like a lot of fun: you can join a team or just be a guest player, and they set it up so you'll play with people of the same level as you. If you're awesome at pinball, you'll play others as good, but if you're a novice, you'll be with other novices. And you can win your own pinball machine, which sounds pretty great. 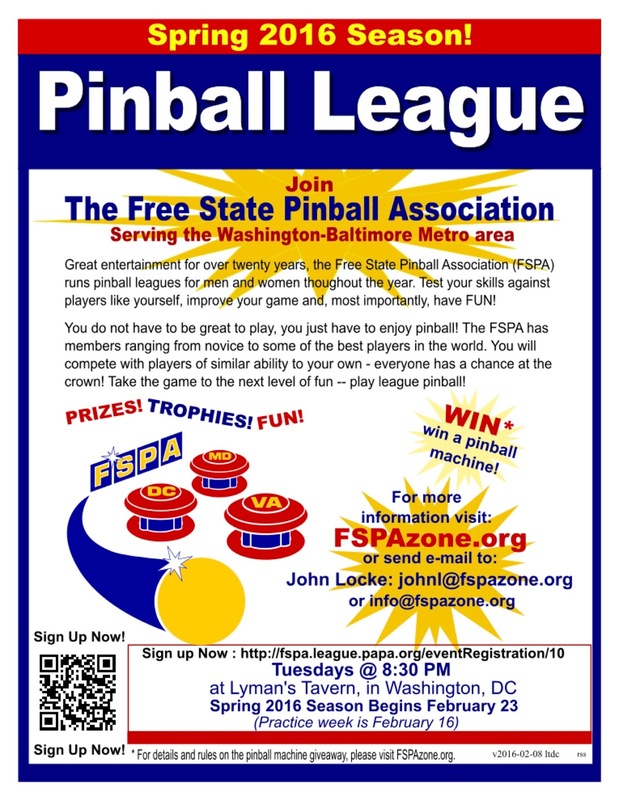 Registration is here and there's more info at FSPAzone.org. The games are every Tuesday at 8:30 and guests and spectators are welcome too. If you haven't been, Lyman's is at 14th and Quincy, right next to the Red Derby, and is a great spot: relaxed, good vibe, and with tasty food. I'm a big fan of the pressed sandwiches with pulled pork, ham and jalapeños. This is pretty neat: a new nonprofit called 11th and Bark dedicated to its eponymous dog park has organized a cleanup of the park this Saturday from noon to 2 pm. The park could use some attention after the snow and such, and it sounds like a fun way to meet neighbors and other dog owners. 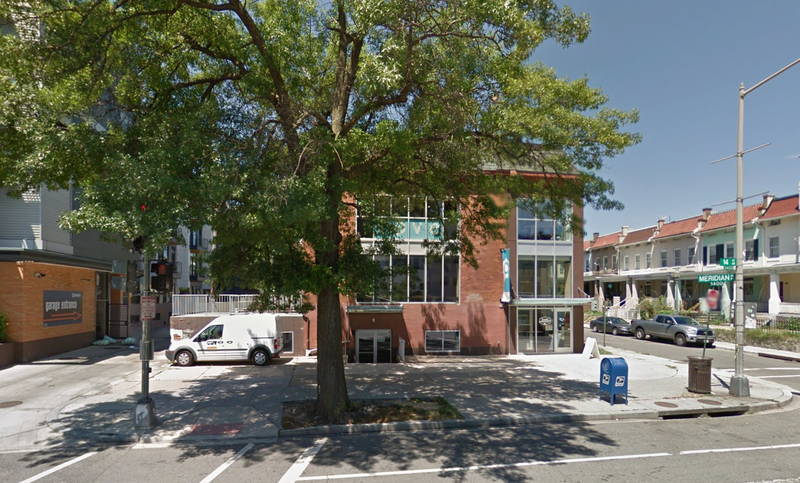 11th and Bark is a DC registered nonprofit committed to assisting the people of Columbia Heights with establishing an official city off-leash dog park. We are working to make the lot at 11th Street and Park Road NW a city dog park with substantial upgrades to its amenities such as improved fencing, landscaping, a water source and more. I've been eagerly awaiting Little Coco's, the Italian restaurant coming to the old Rib Pit Lounge space at 14th and Randolph from the folks behind El Chucho, Quarry House and Jackie's/Sidebar. It's been in the works since about 2014, but they've had a lot of permitting delays -- not unusual for DC bars and restaurants. And today, a reader sent me this picture of some work going on. It looks like they're adding a bay window, or maybe a covered patio. Great to see it coming along, I'm excited for it. The Post wrote about the place earlier, saying it was an Italian version of El Chucho, with about 70 seats total inside and outside. Owner Jackie Greenbaum told me dishes will include pizza, entrees and homemade pastas with a similar floor plan to El Chucho. The pizzas may include interesting combos like olive-oil poached tuna and artichokes, snails and garlic, and butternut squash with pear and taleggio, a type of Italian cheese. They'll also have frozen negronis, shaved ice, and affordable Italian beer and wine. I'm excited for it. I'll update when I hear more. UPDATE: Owner Jackie Greenbaum commented below that they have all their permits, and she told me the next steps are "construction construction construction for the next few months." Good news!! 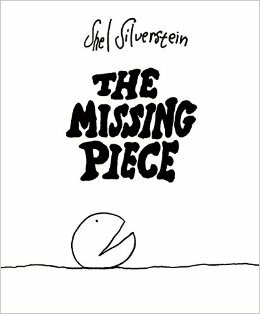 A few weeks ago, after Walls of Books opened, I posed the question of what are we missing in the neighborhood? I did a little survey and about 25 people responded with about 70 ideas -- some of them funny, some of them sarcastic, some of them things we already have, and a lot of them really interesting. Lots of folks suggested a deli or bakery, specifically a Jewish, Italian or Greek one with good sandwiches. I think that would be great. A number of people also suggested a coffee shop around 14th and Spring, which is something I had mentioned in the post -- to me, that means it really would be a good thing to have. A brewery was mentioned by three people, which would be awesome, especially on Georgia, and three mentioned a higher-end neighborhood restaurant -- three people said specifically something like Red Hen, a nice restaurant in Bloomingdale. Another good idea was fast casual near the Petworth Metro, like Taylor Gourmet. That empty space in the new building there is sadly under utilized, though it seems like it's making progress. A few people also mentioned more types of eateries: multiple people mentioned ramen, plus others suggested sushi, Indian, BBQ, Greek and Ethiopian. Yes to all that. As for non-food, multiple people mentioned a movie theater or venue like the Source or Studio Theatre. Maybe Suns Cinema in Mt. Pleasant, which is still nascent, could address that. A couple people mentioned a running store, which sounds good, and others mentioned evening Spanish-language classes "so i can be a better member of my neighborhood," which is a great idea and admirable. Someone mentioned Salt & Sundry, which is a fancy kitchen store, and others suggested a paper store and small, interesting retail. In the comments and in the survey, two people mentioned retail in Park View -- to me, Georgia Avenue could really have some interesting retail and food destination -- there are so many empty buildings and lots of new housing going in. Someone also suggested child care, which is a good one. Two people also suggested a full-service gym. There was also Trader Joe's, a florist, and a local ice cream shop. As for bigger ideas, some seemed kind of bitter: "less public housing, less crime, better restaurants" and some more tangible like more retail and fewer chains. There were a couple of sarcastic responses too, and a couple of funny ones: lasers, a 300 foot cotton candy statue of Hall and Oates, and your mom. Here's the full list of responses. Each person could put up to three. What do you think? Good ideas? Anything else you'd suggest? I'm planning to send this to a few local developers and business owners I know to see if it spurs any ideas, too. Affordable food between the blocks where Target and Florida ave are. Beer garden and restaurant coming to Georgia Avenue from Kangaroo Boxing Club folks! Whoa!! The folks behind Kangaroo Boxing Club on 11th Street are opening a beer garden in Park View, at 3333 Georgia Avenue NW! This is the same shopping center as the US Post Office and the new Walls of Books used bookstore. Eater reports they'll have a restaurant and outdoor beer garden, so I assume they'll be inside the shopping center and then in the parking lot. 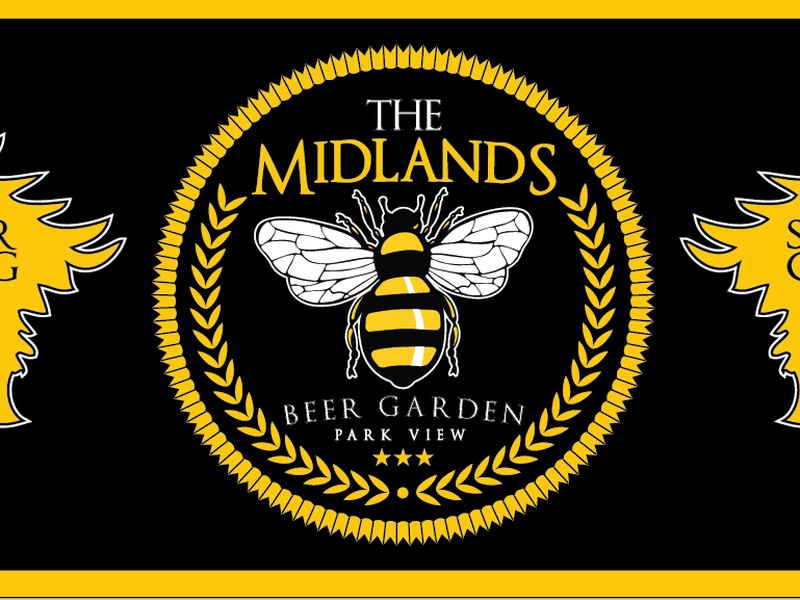 The spot is going to be called the Midlands, and from their website they say they'll have 15-30 beers and "totally not pretentious" sandwiches. Here's the space now: it's the second from the left, next to Beau Nails, which I believe is closed. Eater says they're aiming for spring. Awesome. 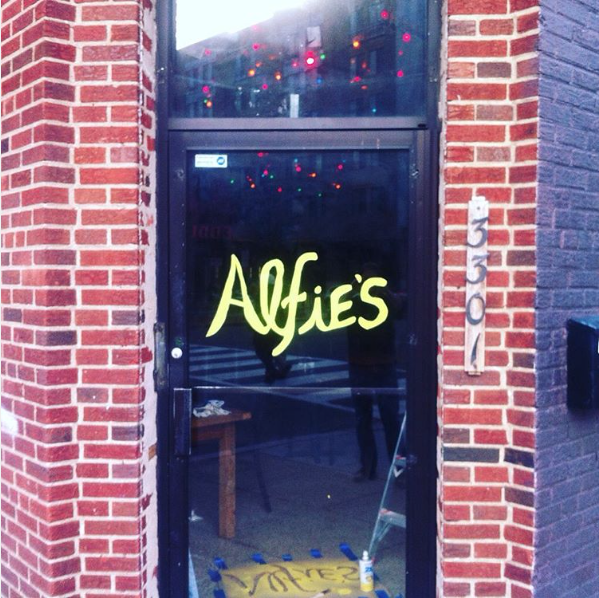 What with Alfie's just opening down the street and Walls of Books a couple of weeks ago, Georgia really seems to be heating up. If you've ever tried to get from Columbia Heights to the newly happening areas of Brookland or NoMa you may have found it's a pain -- aside from a cab or Bikeshare, there's no great direct route -- the H buses mostly run for commuting hours. The city is working to fix that, undertaking a study on transportation between Wards 1 and 5. Calling it the DC Crosstown study, they had their first public meeting yesterday, and Park View DC has the rundown: a lot of people asked for dedicated bus lanes, enhanced pedestrian crossings, and protected bike lanes, for example. The city is also looking to create a new Circulator route that goes to NoMa, and last year asked for help on which route: two of them include Columbia Heights as the destination -- one route runs from NoMa up to the Washington Hospital Center then over to Columbia Heights, while another ran from NoMa up Florida, 9th and 11th to Monroe Street. That comment period is over, so we'll see if Columbia Heights is the winner. Nice to see the city focusing on this. Now if only we could get some way to get to H Street easily. A bit ago I wrote about Willow at 843 Upshur, which has all kinds of neat clothes, gifts and more for adults and kids -- it's a great spot. If you haven't been, you should go. 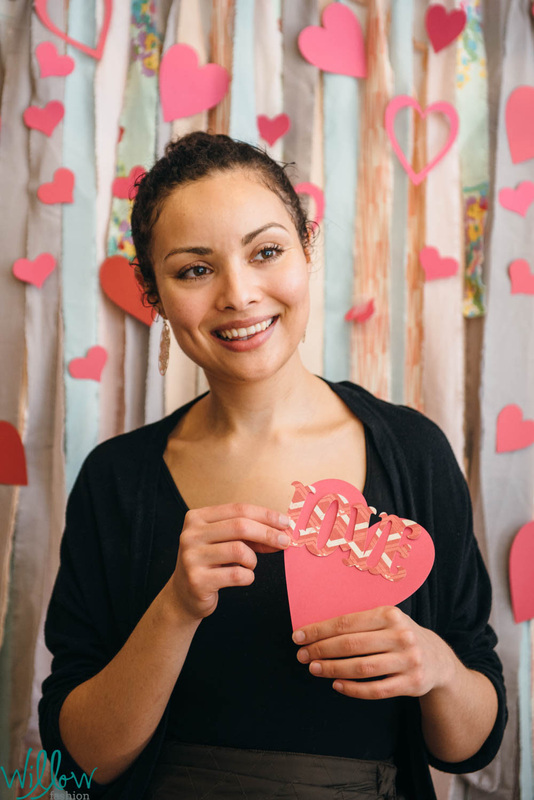 And here's a good excuse to go: they're hosting a Valentine's Day party all day tomorrow on Thursday, February 4. It sounds fun: there's deals on clothing, a happy hour with chocolate adult drinks, more more. Read on! Great news! Alex McCoy, who was a finalist on Food Network Star, will open Alfie's today in the old Mothership space at 3301 Georgia Avenue NW. McCoy was previously chef at Duke's Grocery. The place is technically a pop-up for roughly nine months, but McCoy tells Washingtonian that he may stay in Park View if it's going really well. Otherwise, they plan to move to 845 Upshur Street NW, which was their original plan. That space, formerly China American Inn, required more work than they anticipated. The Washingtonian and Petworth News report the menu sounds pretty diverse (and delicious) with various curries from different regions, laab salads (Thip Khao has something similar) plus an Aussie burger, referencing the many Australian expats in the country. They'll also have fermented Issan sausage, which is from northern Thailand. Other dishes include goat stew, khao soi beef rib in curry noodles, and Thai grilled chicken, plus rotating seasonal dishes, vegetarian items and snacks like fried grasshoppers, durian chips, and cashews stuffed with peppers. From the descriptions, it sounds pretty spicy, but thankfully there will be lots of beer and cocktails to help cut the spice. They'll have Asian beers and regionally-inspired cocktails, like one with herbs, coconut milk and Mekhong whiskey, and a Tiger beer shandy with house made ginger, cardamon, lemon grass, cilantro root and lemon juice simple syrup. Yowsers. From the Washingtonian and Petworth News articles, the space looks pretty much like it did in the Mothership days, with some nice touches. It sounds pretty great. I hope to go soon. They're open Tuesday-Saturday, 5-10 pm, and there are 39 seats. They also take reservations. Some more news about the restaurant and bar coming to the space where the Getaway used to be at 14th and Meridian: it's going to be a Jamaican place. A reader stopped by the other day and chatted with workers, who had just painted a Jamaican flag on the wall. Sounds good to me: we are experiencing a lack of Jamaican food after Sweet Mango at Georgia and New Hampshire closed. A couple of weeks ago I found out from other workers that it would indeed be a bar and restaurant. Presumably it would be in the basement and first floor, like the old Getaway and Social. When I hear more, I'll update. Here's the building.